Even though you’ve hired a general contractor to coordinate and manage your home remodeling project it is important that you monitor the project as well. Overseeing a home remodeling project and contractors is crucial for ensuring that you get the finished product that you are looking for. Lack of vigilance by the homeowner during a construction or home remodeling project is fraught with dangers of cost overruns, schedule delays, poor craftsmanship, and construction that is not compliant to the remodeling plans. The first step in overseeing a home remodeling project is reviewing the remodeling contractor’s contract and making sure it fully captures the details of your project, before you sign it. The contract should include a full description of the scope of the project and should break out materials to be used and labor costs, and include a detailed schedule. It’s also wise to have your attorney review the contract to make sure nothing is missing. The contract should also include the contractor’s company name and address, along with his state contractor license number. The majority of states require contractor licenses for such residential construction jobs as electrical, plumbing, HVAC, roofing, framing, and general contracting. The contract should also include a payment schedule with payment milestones tied to completion dates of various phases of the home remodeling project. The definition of “completion” should also be defined. For example, when the work on a particular phase of a project has been completed by the contractor and the homeowner and local building inspector are satisfied with it and have signed off on the work performed. Only then should the contractor be paid for the completed milestone. The contract should also include a warranty section, along with how work change notices will be handled, and who will pull permits. Normally the contractor should pull the permits. In addition it should include language on how the home remodeling jobsite will be maintained and cleaned. Finally all named parties in the contract should sign it. 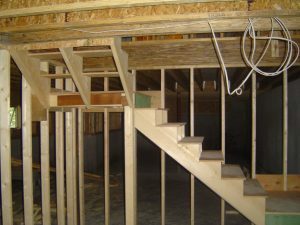 During the actual construction it is important to oversee the home remodeling project daily. This way you can be on top of any construction deviations to the plans and are available to address any questions the contractors may have. Carry a notebook with you during your daily inspections and jot down any issues you see with craftsmanship and work being performed. Also, make notes on the dates materials were received on the jobsite and how the work is progressing to the schedule outlined in the contract. In addition, note down material and weather delays or work slowdowns, e.g. where less than a full crew show up on the jobsite. Bring these issues up promptly with the general contractor so that he can address them before it costs you extra money and time. When making payments always pay by check and make them out to the contractor’s company name as spelled out in the contract. Do not pay cash or make checks out specifically in a contractor’s name. As already mentioned pay for work completed. Never pay upfront for work to be performed, other than possibly a small initial deposit for earnest money. Finally, never make the final payment to the contractor until a final inspection by both you and the local building inspector has occurred and the inspector has issued a certificate of completion and/or occupancy permit and you are satisfied with the work. 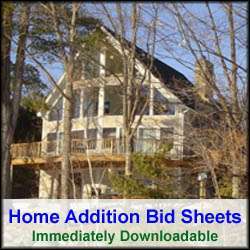 For more help on either hiring a general contractor or acting as your own general contractor see my home addition and home remodeling bid sheets. They can save you a fortune by helping you to properly plan your home construction project and hire the right general contractor and/or subcontractors.